A gourmet grill designed with the urban chef in mind. Three stainless steel burners delivering 36,000 BTUs of power plus an 11,000 BTU side burner, all packed into a size perfect for even the smallest spaces. Versatile Cooking System: Three stainless steel linear burners deliver over 36,000 BTU/hr of power. 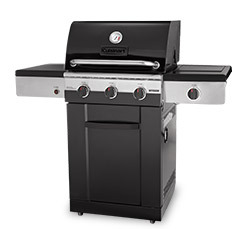 Side Burner: 11,000 BTU/hr, stainless steel burner, flame control valve and storage cover. Multi Spark™ Ignition System: Features multiple electronic ignition points for quick reliable starts. Porcelain Cast Iron Cooking Grates: Offer the best overall grilling surface and superior heat retention. Porcelain Enamel Warming Area: For warming food and adding a higher level of low temperature cooking to your grill. Porcelain Heat Distribution Plates: Disperse heat evenly across the grilling surface and provide protection for burners. Easy Clean Grease Collection System: Makes clean-up quick and effortless. Keeping your BBQ free of grease build-up will eliminate flare-ups, grease fires, and prolong the life of your BBQ. Porcelain Enamel Roasting Hood: Reinforced and double-lined to offer superior heat retention and roasting capabilities. Space Saving: This barbecue is compact in size, making it ideal for smaller yards and patios.